Clint Adams, the Gunsmith, teams up with Ki to track down a gang who stole a sword in the custody of a friend of Clint’s, killed the man’s wife, and kidnapped his daughter. Clint’s friendship with Secret Service agent Jim West is mentioned. Clint has heard about Ki, the partner and bodyguard of rancher Jessie Starbuck, from Marshal Custis Long. Jessie Starbuck and Ki appeared alongside Marshal Custis “Longarm” Long in the first ten Longarm Giants by Tabor Evans, as well as their own series, the Lone Star books by Wesley Ellis. 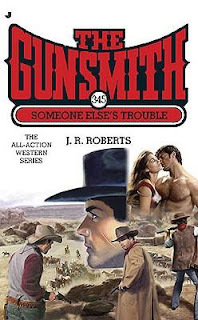 Several of the Gunsmith books by "J.R. Roberts" (Robert J. Randisi) refer to Clint’s friendship with Jim West, who is from the classic TV western The Wild Wild West. Clint’s friend Talbot Roper, a Pinkerton and recurring character in the Gunsmith books, appears as the main character of two novels by Randisi, Bullets and Lies and The Reluctant Pinkerton.